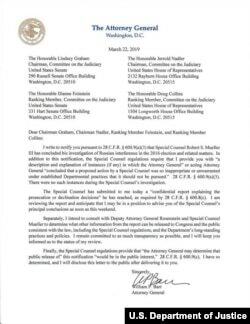 By Ken Shwartz – (VOA News – UPDATED) Special counsel Robert Mueller says neither President Donald Trump, his campaign, nor anyone associated with it conspired with Russia to interfere in the 2016 presidential election, according to a summary by Attorney General William Barr released Sunday. 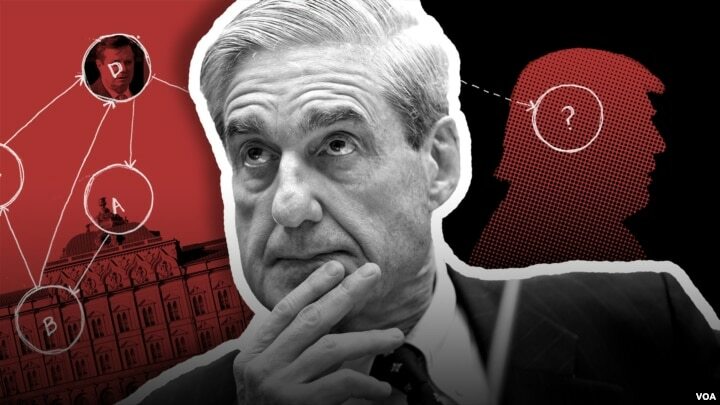 “The Special Counsel’s investigation did not find that he Trump campaign or anyone associated with it coordinated … with the Russian government in its election interference activities,” Barr’s summary said. 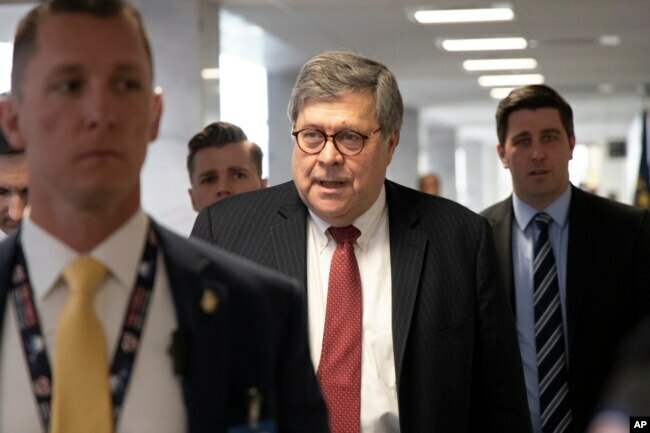 FILE – Since confirmed Attorney General nominee Bill Barr arrives for a meeting on Capitol Hill in Washington, Jan. 26, 2019. 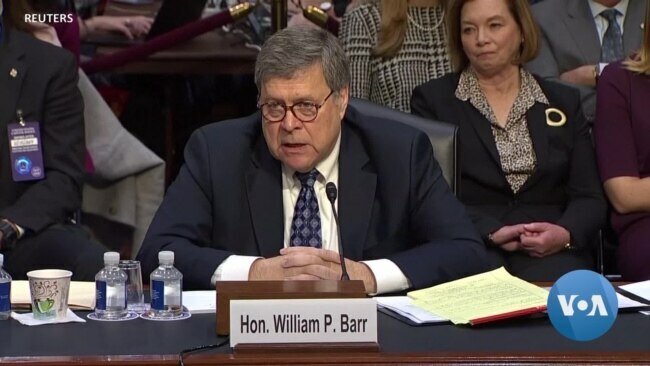 Several Democratic presidential candidates – Kirsten Gillibrand, Cory Booker, Kamala Harris and Elizabeth Warren – also said Sunday that a summary of the Mueller report filtered through the president’s “hand-picked attorney general” is unsatisfactory. By Rob Garver (VOA News) - Americans were forced to wait a bit longer Saturday for news about special counsel Robert Mueller‘s investigation into foreign meddling in the 2016 U.S. presidential campaign. 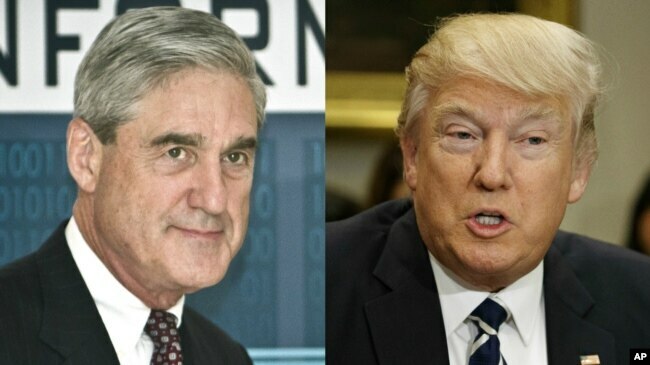 FILE – Special counsel Robert Mueller and President Donald Trump. But Barr spent Saturday reviewing the report, and as of midafternoon, according to a Justice Department spokesman, his summary for Congress was not expected for at least another day. White House spokesman Hogan Gidley said the White House had not received and had not been briefed on the report. Echoing comments of the night before from White House press secretary Sarah Sanders, he said the next steps in the investigation were up to Barr. The central questions that Mueller, a former FBI director, set out to answer: Did Donald Trump or his aides collude with the Russians to undermine Democrat Hillary Clinton’s campaign in 2016 with embarrassing emails stolen from the Democratic National Committee and Clinton’s campaign chairman? Or was the president-to-be merely the fortunate beneficiary of Russia’s malicious tactics? And did Trump attempt to torpedo the subsequent investigation to protect himself and his political advisers and aides? This is the Justice Department’s notification to Congress regarding the conclusion of the Mueller investigation. House Speaker Nancy Pelosi, however, told House Democrats that the full report must be released to Congress. The California Democrat sent a letter to colleagues ahead of an “emergency” call with all rank-and-file lawmakers Saturday to discuss where Democrats “go from here” in their oversight of the White House. 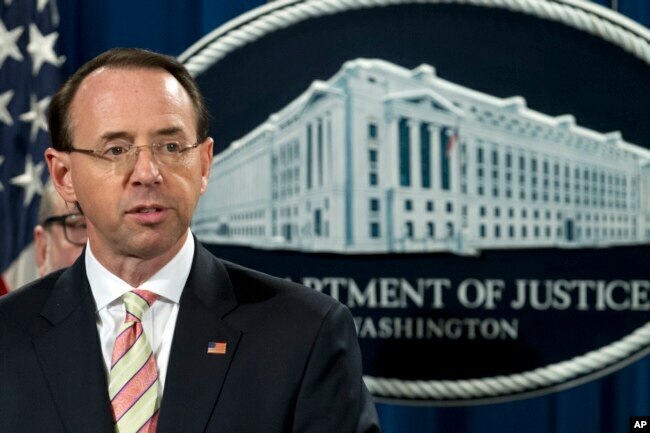 FILE – Deputy Attorney General Rod Rosenstein speaks during a news conference in Washington, Nov. 28, 2018. 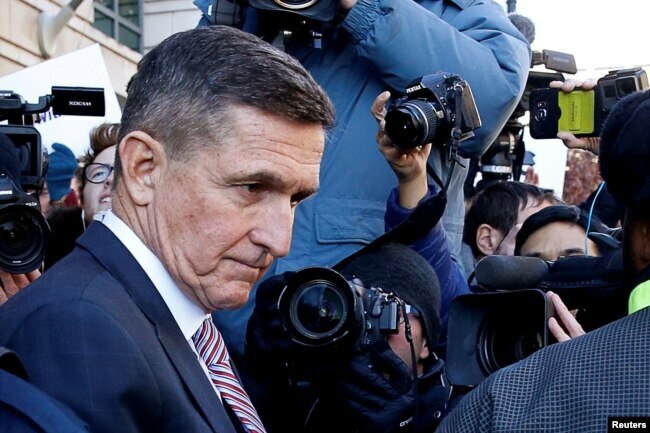 FILE – Former U.S. national security adviser Michael Flynn passes by members of the media as he departs after his sentencing was delayed at U.S. District Court in Washington, U.S., Dec. 18, 2018. Trump’s choice for attorney general, former Sen. Jeff Sessions of Alabama, recused himself from supervising the Russian investigation because he had served as a senior adviser to the Trump campaign, which posed a conflict of interest. That decision angered Trump, and left the Justice Department’s second-in-command, Rosenstein, in charge of the investigation. FBI Director James Comeydisclosed the existence of the investigation during a testimony before Congress in March. 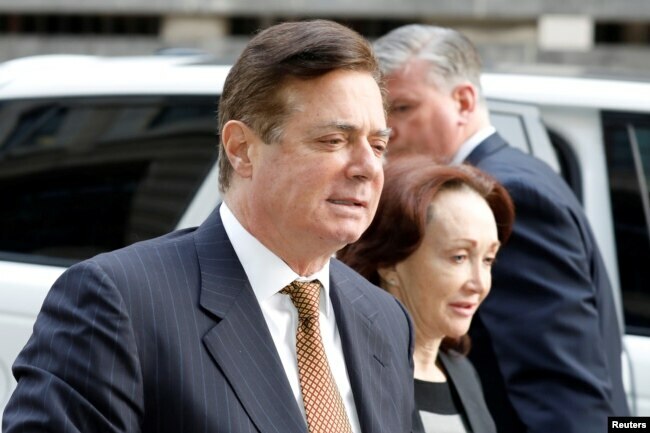 FILE – U.S. President Trump’s former campaign chairman Paul Manafort arrives at a hearing at U.S. District Court in Washington. The indictments had nothing to do with the Trump campaign specifically but were widely seen as providing prosecutors with leverage over Manafort and Gates, who would likely have been privy to any collusion that might have occurred during the election. 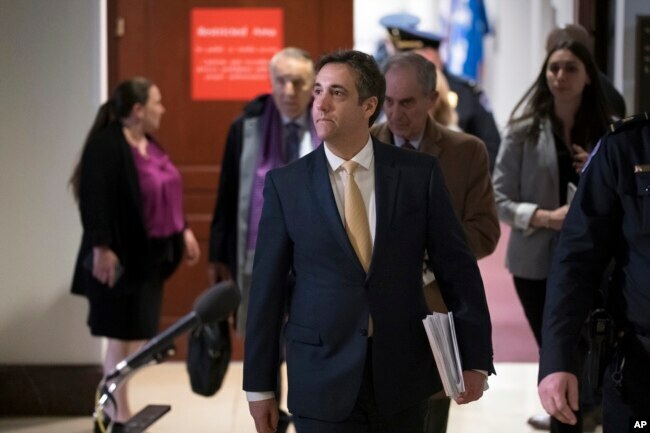 FILE – Michael Cohen, President Donald Trump’s former lawyer, leaves a closed-door interview before the House Intelligence Committee at the end of three days of congressional testimony, in Washington, Feb. 28, 2019. 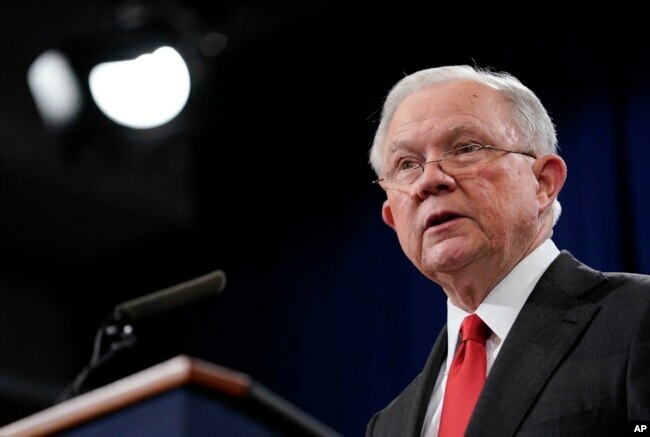 FILE – Then-Attorney General Jeff Sessions speaks during a news conference at the Department of Justice in Washington, Nov. 1, 2018. Masood Farivar contributed to this report. Some information for this report came from Associated Press.